The 2019 boys 4x100 relay has been wild and crazy. Oh yeah, and so far, it has also been a fast one. Not only has it been like musical chairs recently, but it is something that has started from week one. Houston Strake Jesuit kicked off the season on February 15th with an outstanding 41.08 fresh out of the gate. That performance was a huge week one surprise as the weather wasn't conducive for that type of time with the cold and wet conditions, but their time was still blazing fast. In week two, Fort Bend Marshall took the reigns of the number one spot with their 40.76 at the Fort Bend Relays. The Buffalos were right back at it the following week when they went 40.79 and then 40.90 the week after. That weekend also saw Klein Forest become the second team in the state to break 41.0 with their 40.92. Fort Bend Marshall's handle on the top spot ended in week four when the DFW boys got together and dropped a bomb on the state. Tyler John Tyler led a trio of teams under 41.0 with their 40.66. An outstanding anchor leg saw them out run the competition with elite results as DeSoto (40.77) and Lancaster (40.91) joined the state's elite teams to run 40 point. A week later, DeSoto and Lancaster traveled to Houston with a shot to take on Marshall and Klein Forest and the rest of the Houston area's best. But, it was Marshall who blazed the Texas Southern University track with their 40.66 to tie John Tyler for the top spot. This past Friday, Marshall took sole possession of the top spot again when they ran 40.61 at the Victor Lopez Classic. However, their stay at #1 would be a short one. Duncanville (who had been in both races when John Tyler and Marshall ran their 40.66s) were only able to run 41 lows so far on the season, but they knew they were better than what their performances had shown. They proved it on Friday at the Summit Jaguar Relays when they took the top spot. Duncanville ran 40.57 to leap frog John Tyler, Marshall and all of the other 40 point teams to skip to the top spot. Mansfield Summit also ran well and joined the 40 point club as they ran 40.98. Duncanville's party at the top spot would almost be as short as Marshall's was, thanks to.....Marshall. One day after running the top time and then having it toppled moments later by Duncanville, Marshall would climb back to the top of the totem pole with their 40.39 race in the Victor Lopez finals. So, here we are with the lead going and coming and bouncing around from place to place. 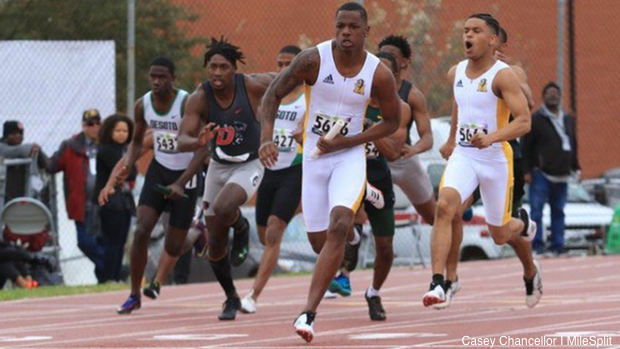 Does anyone really have a handle on the top 4x100 relay spot or is it still potentially going to bounce around some more as Texas boys teams continue to improve throughout the remainder of the season? There are currently seven teams to run sub 41. With over a month left in the season and surely better weather to come, how much better can the event get this season? Will the trend of sub 40 4x100 relays continue? Only two teams in history have ever run under 40.0 until 2017. Fort Worth O.D. Wyatt and Houston Forest Brook were the only two teams to ever do it, but their company has more than doubled in the last two years. In 2017, Port Arthur Memorial joined them and just last season, Katy Seven Lakes and The Woodlands added their names to the legendary list. But, the last two years were even more important than the three 39 point teams. The amount of sub 41.0 4x100 relays have been unbelievable. From 2010 to 2016, Texas averaged 7.57 teams to run under 41.0 (2010 - 2, 2011 - 5, 2012 - 6, 2013 - 7, 2014 - 10, 2015 - 11, 2016 -12). Yet, in both 2017 and 2018, that number spiked up to 21 teams running 41.0 and faster. Will this year see another sub 40 point 4x100 team? Will another state record fall and will even more teams break the 41.0 barrier? There are currently 17 total Texas boys teams with times under 41.50 and only a few adjustments away from 41.0 with five to six weeks left in the season. Tune in to see the remainder of the 2019 season and see if we will get another 39 point and if 2019 continues the barrage of sub 41.0 4x100 relays.